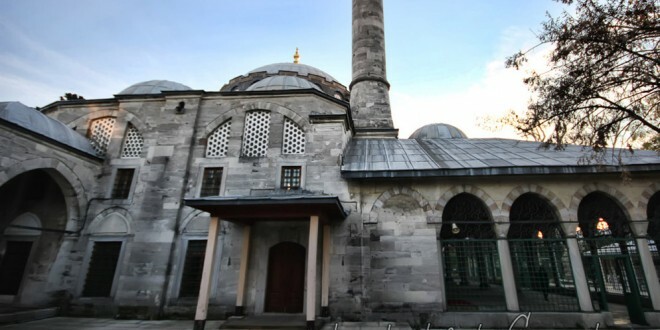 Atil Valide Mosque: Here too, protruding mihrab is covered by a semidome, as in the case of the Molla Çelebi and Semiz Ali Pasha Mosques. The building was widened, perhaps by Davud Aga in 1583, with the addition of twe domes on each side of it. A second riwaq was added to the potico for the late comers. The mosque in renowned for its tiles, and the gallery ceilings on the enterance side are stil decorated with the original ornamental paintings. This very large complex was built for Princess Nurbanu. Nurbanu Sultan was the mother of Murad III and the wife of Selim II (son and successor of Kanuni Sultan Süleyman). Built again on sloping ground, it includes a mosque, a madrasah, a convent (tekke), a Koran school and a hadith school, a hospital, a questhouse, a caravanserai (with very large stables, including camel stables, being situated on the Anatolian shore), a refection hall, a public bath and a primary school. The buildings are situated on different levels, with the refectory, guesthouse, caravanserai and hospital forming an important autonomous social unit, separated from the group formed by the mosque, madrasah and convent by a street. The primary school is situated on an elevated storey, with a street passing thorugh the void created below. Apart from the mosque, madrasah and convent, the buildings have lost much of their original appearance because of the misuses they have suffered at different times.